Sarah Nader- snader@shawmedia.com Fraternite de Notre Dame nuns listen during Thursday's Zoning Board of Appeals hearing in Woodstock July 9, 2015. Supporters and opponents of the Fraternite of Notre Dame's request to build a school, nursing home, brewery and other amenities at its Coral Township complex will have to wait a few more weeks to see whether the McHenry County Zoning Board of Appeals will vote to recommend approval. 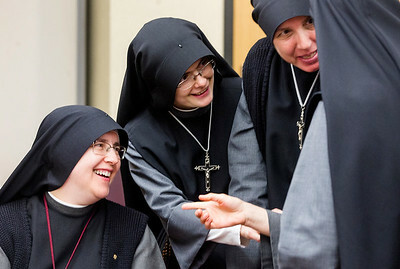 Sarah Nader- snader@shawmedia.com Mother Superior Mary Martha (left) talks with Fraternite de Notre Dame nuns during a break at Thursday's Zoning Board of Appeals hearing in Woodstock July 9, 2015. Supporters and opponents of the Fraternite of Notre Dame's request to build a school, nursing home, brewery and other amenities at its Coral Township complex will have to wait a few more weeks to see whether the McHenry County Zoning Board of Appeals will vote to recommend approval. 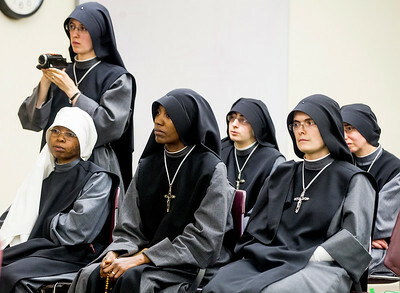 Fraternite de Notre Dame nuns listen during Thursday's Zoning Board of Appeals hearing in Woodstock July 9, 2015. Supporters and opponents of the Fraternite of Notre Dame's request to build a school, nursing home, brewery and other amenities at its Coral Township complex will have to wait a few more weeks to see whether the McHenry County Zoning Board of Appeals will vote to recommend approval.